LucasArts has updated the Star Wars: The Old Republic website with a new Galaxy Map. Click on over to check out the five major sectors of the Known Galaxy, updated profiles of the game's planets, and interactive models of the player Starships you'll be flying. Dark Horse Comics has updated their blog with new preview pages from Crimson Empire III - Empire Lost, the continuing adventure of former Imperial Guardsman Kir Kanos. Look for issue #1 of Crimson Empire III to hit comic book shops at the end of the month! adidas has created some crazy Star Wars themed items in the past, but their latest may be the craziest yet. The Wampa Shoes offer up a faux Wampa fur upper (made from horsehair) and a special Wampa tongue badge. Pricey at $150 a pair, but definitely unique! Today and tomorrow, you'll find a "Two for $12.99" sale on all Star Wars basic figures. Yes, the deal appears to include Saga Legends, Clone Wars, and the Vintage Collection figures, but as always, the sale may vary based on your local store's policies. Good luck on your toy runs this weekend! A new set of LEGO Star Wars catalog images has hit the internet. The pictures offer up a great preview of LEGO's 2012 Star Wars offerings, including a nifty new mini-ship/mini-figure/planet series. You can check out the pics in Rebelscum's LEGO Forum. Want a Sneak Peek at the 2011 Fans' Choice Poll Results? OK, it's totally unofficial and totally just for fun, but someone (me) has posted an early sneak preview at what could be the probable results of the 2011 Hasbro Star Wars Fans' Choice Poll. As of this post, the results from 21 participating fansites have been collated and the vote points calculated and it looks like a certain Jedi Librarian leads all vote-getters. Vintage Collection Wave 9 is now in-stock at Entertainment Earth! The wave includes some repacks, some "Revenge" carded variants, and three brand new figures - VC68 Rebel Trooper (Echo Base), VC69 Bastila Shan, and VC70 Ponda Boba (Walrus Man). UPDATE: Back in stock! Grab 'em while you can! 2011 Han's Hideout Star Wars Fans' Choice Poll Results! Thanks to everyone who voted and stay tuned for details on the next round of fan choice voting from Hasbro and Star Wars Insider! Entertainment Earth is running two new sales this week. First, you can get free shipping when you buy at least $20 worth of in-stock movie themed merchandise from Vandor. You can also get your 5th Vinyl figure for FREE when you add 5 in-stock vinyl figures to your cart. Today and tomorrow at Toys R Us, you'll find a nice sale on the exclusive Battle Over Endor Rebel Pilot 4-packs. The sets are just $21.99 each, which is $10 off the regular price. In addition, Star Wars Transformers are on sale with a "Buy 1, Get 1 50% off" promotion. Star Wars Celebration VI will feature the "As You Wish" Charity Project. The Dented Helmet costuming group and the 501st Legion are presenting Boba Fett and Clone Trooper helmets to talented artists and studios to be re-imagined. The helmets will be on display at Celebration VI and then auctioned off online by Make-A-Wish after the show. The Official Star Wars Blog has posted a sneak preview of the front cover to Star Wars: Scourge, the upcoming book by Jeff Grubb. The book will be available in paperback and ebook formats and is due out on April 24, 2012. Wave 9 of the Vintage Collection basic figure line has hit a Target store here in Minnesota. My pal GrandMoffNick from the Minnesota Forums over at JediDefender found the three new figures - VC68 Echo Base Rebel Trooper, VC69 Bastila Shan, and VC70 Ponda Boba (Walrus Man) - at his local Twin Cities Target store. Good luck on your next toy run! My pal Jayson over at Yakface.com has dug up what appears to be an upcoming Clone Wars figure of Clone Trooper Cutup from Domino Squad. No official word yet on where this figure will pop up, but hopefully we'll find out at NYCC in a couple weeks! Mimoco has updated their blog with the details on Star Wars MIMOBOT Series 7! Included in Series 7 are Boba Fett, Boushh, Lando Calrissian, Bossk, and Carbonite Han! Follow the link to check out the MIMOBOTs! Our pals at JediDefender.com have posted some great preview pics of the Pit Droid figure coming with Ratts Tyerell next year. Look for both Ratts and his Droid in the Vintage Collection Phantom Menace wave, which should hit stores around the end of the year or early January 2012. A quick reminder to all - don't forget today is the last day to take part in the 2011 Han's Hideout Star Wars Fans Choice Poll. Just send an e-mail with your top ten most wanted 3.75" Hasbro Star Wars figures, making sure to put "Hasbro Fan Choice 2011" in the subject line please. E-mails will be accepted through 11:59pm CDT tonight! This week at Toys R Us, you'll find a sale on the LEGO AT-AT Walker and LEGO Hoth Echo Base constructions sets. Both sets are $10 off the regular price, just $109.99 for the LEGO AT-AT set and $84.99 for the LEGO Hoth Echo Base set. Not the best deal, but they are on sale! The Toys R Us exclusive Death Star Trench Run Ultimate Battle Pack is now hitting TRU stores across the country. I saw one yesterday at my local Toys R Us here in Minnesota, and while the boxed presentation is fantastic, I just had to pass due to the $100 price tag. Let's hope there is a nice sale in this pack's future! Good luck to all you looking for one! Star Wars: The Old Republic - We've Got a Launch Date! It's here, it's finally here! BioWare and LucasArts have officially announced that Star Wars: The Old Republic will launch on December 20th, 2011 in North America! Those who pre-order the game and enter their pre-order code on StarWarsTheOldRepublic.com will be eligible for early game access, so buy today to secure your place in line! LucasArts has also updated the Star Wars: The Old Republic website with a new Developer Dispatch video and Blog Post on the Companion Characters that will be available in the game. Companions are designed to complement your strengths or weaknesses and provide company for the epic journey ahead. Lucasfilm and Twentieth Century Fox Home Entertainment announced today that Star Wars is the bestselling catalog Blu-ray Disc of all time in just its first week of release. Congrats to all of you for helping Lucasfilm make even more money off Star Wars! Enjoy those Blu-rays! Have you noticed cleared Vintage Collection pegs at your local Target store? It seems that Hasbro reps are clearing the peg-warmers at many Target stores across the country. If you were holding out for a sale to stock up on Sandtroopers, Dengars, or Cloud Car pilots, you may want to reconsider and buy them while you can! Sideshow Collectibles has announced that the edition size for the exclusive edition 12" Boba Fett figure set has been set at 2000 pieces worldwide. The Wait List is available if you missed out on pre-ordering one, or you can always grab the regular version (no display base included). Do you sometimes wonder what you're missing by not having a subscription to Star Wars Insider? If so, then check out this free digial sampler to read some example articles, features, and comic strips from the magazine. The Official Star Wars Blog has posted a sneak peek at some pages from The Phantom Menace Expanded Visual Dictionary. 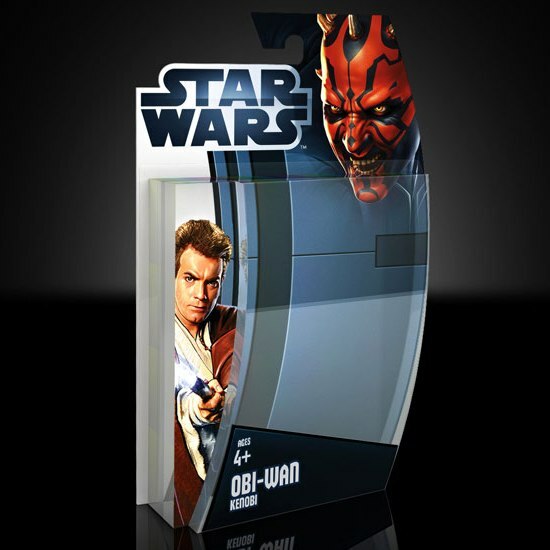 The book, which is due out in January 2012 from DK Publishing, is an updated, expanded edition of The Phantom Menace Visual Dictionary, fully redesigned and sporting several new layouts. The New York Comic Con website has been updated with details on the 2011 NYCC Hasbro Star Wars Panel. The panel will take place on Friday, October 14th, from 5:00pm to 6:00pm (Eastern) in room 1A23. Come join members of Hasbro's Star Wars team as they discuss their current and upcoming Star Wars toys and action figures! Scott has posted another new entry in JediDefender's Collect All 92! forum. Click on over to check out the comparison pics for one of Jabba's Palace Guards, Wooof - aka Jabba's Palace Klaatu! Have you been following the drama surrounding the redemption form for the 2011 Vintage Collection Mail-Away Prototype Armor Boba Fett figure? If not, you'll want to check out Yakface.com for their mini-Q&A with Hasbro on which forms are OK to use when you send away for your Prototype Fett! Our pals at JediDefender.com have posted some great preview pics of the two Naboo Pilot figures coming next year. Look for both Ric Olie and the generic Naboo Pilot figure in the Walmart exclusive Phantom Menace wave, which should hit stores around the end of the year or early January 2012. Arriving at your local comic book shop this week are two new comics from Dark Horse - Star Wars Jedi: The Dark Side #5 and Star Wars: Knight Errant - Deluge #2. Can't wait to read them? Then follow the links for previews to tide you over! This year, for the first time, Hallmark will be selling an exclusive Keepsake Ornament 2-Pack at New York Comic Con! 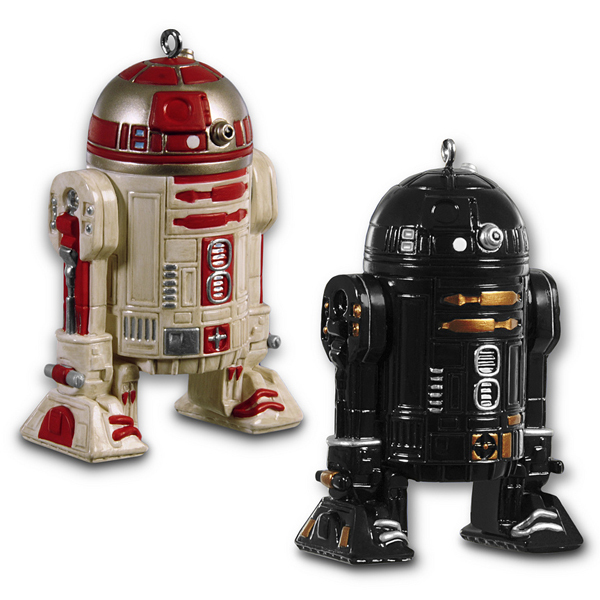 The 2-pack features a pair of astromech droids, R2-Q5 and R2-A3. The pack will be limited to 800 sets with limited amounts being sold each day of the show. Entertainment Earth is now taking orders for the Clone Wars Kit Fisto Jedi Starfighter and the Star Wars Imperial TIE Bomber. Both were formerly Walmart exclusives, so I guess this is good news for those who missed them the first time! This week at Toys R Us, you'll find a "Buy 2 Get the 3rd Free" sale on select Star Wars items. 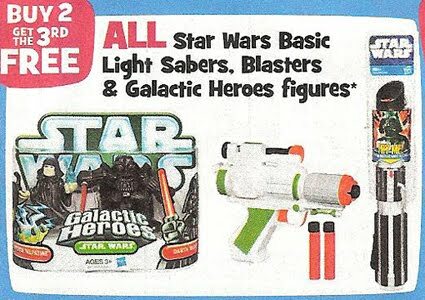 Included in the sale are all Star Wars basic lightsabers, role-play blasters, and the Galactic Heroes figure 2-Packs. A quick reminder to all - don't forget to take part in the 2011 Han's Hideout Star Wars Fans Choice Poll. Just send an e-mail with your top ten most wanted 3.75" Hasbro Star Wars figures, making sure to put "Hasbro Fan Choice 2011" in the subject line please. E-mails will be accepted through 11:59pm CDT on Sunday, September 25th. LucasArts has updated the Star Wars: The Old Republic website with a new Studio Insider post. In this entry, Principal Lead Animator Mark How discusses the work that goes into creating the game's combat animation. Dark Horse Comics has updated their blog with new spaceship sketches from the latest Star Wars: Knight Errant story arc. Look for Star Wars: Knight Errant - Deluge #2 on shelves this Wednesday, September 21st. Sideshow Collectibles is now taking pre-orders for the 12" Boba Fett figure. Click here to pre-order the Sideshow Exclusive version (with display base) or click here to take advantage of the FLEXpay option. UPDATE: The Sideshow Exclusive version is sold out! Click here to pre-order the regular edition or here for the FLEXpay option. Sideshow Collectibles has announced the final edition sizes for two upcoming products. The regular edition 12" Commander Gree figure edition size has been set at 5000 pieces worldwide, while the regular edition 12" IG-88 figure edition size has been set at 2500 pieces worldwide. 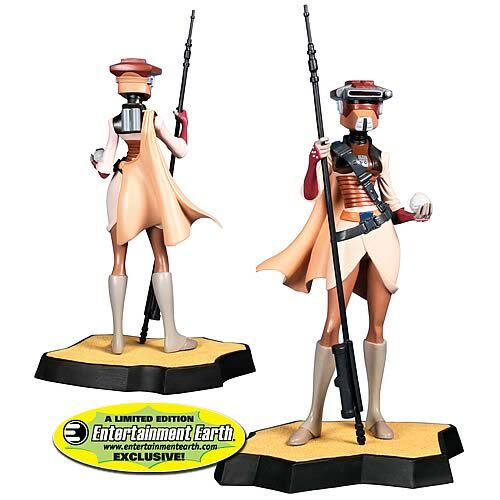 Entertainment Earth is now taking pre-orders for an exclusive Princess Leia in Boushh Disguise Animated Maquette from Gentle Giant. The statue is limited to only 1,000 pieces worldwide and should ship in February 2012. Vintage Collection Wave 9 is now in-stock at Entertainment Earth! The wave includes some repacks, some "Revenge" carded variants, and three brand new figures - VC68 Rebel Trooper (Echo Base), VC69 Bastila Shan, and VC70 Ponda Boba (Walrus Man). Grab 'em while you can! In the latest Q&A session over at Star Wars Action News, Hasbro has confirmed that the Saga Legends action figure line will be replaced by the new Movie Heroes line. The Movie Heroes line is expected to use the nifty Darth Maul themed cardback that was revealed earlier this year and will continue to focus on the most popular characters from all six films. Just a reminder that Sideshow Collectibles' 12" Boba Fett figure will go up for priority pre-ordering Friday, September 16th, at 10AM Pacific. To whet your appetite, Sideshow has posted the product image gallery a bit early! The Official Star Wars Website, StarWars.com, has a brand new look! As the site restarts this week, you'll find that much of its past content has been taken offline for now. Fan favorite stories and features from years past may be periodically dusted off and put back up for new audiences to explore, so keep an eye on the site as it evolves over the coming months. Arriving at your local comic book shop this week are two new comics from Dark Horse - Star Wars: Invasion - Revelations #3 and Star Wars: The Old Republic - The Lost Suns #4. Can't wait to read them? Then follow the links for previews to tide you over! Gentle Giant has updated their blog with a new Q&A session. Follow the link to check out their answers to a variety of questions as well as a pair of new Star Wars Mini-Bust previews - Sebulba and General Veers! Just a reminder that JediDefender.com is giving you the chance to win the 2011 San Diego Comic-Con "Revenge of the Jedi" Death Star Box Set from Hasbro! Check out their Give-Away page for all the details on how you can enter to win this elusive set! 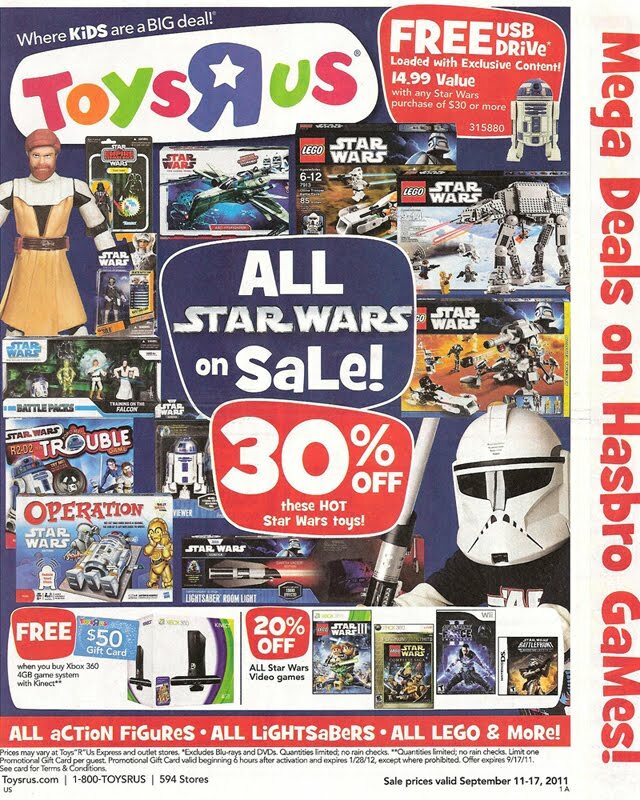 This week at Toys R Us, you'll find a mega Star Wars Sale! All Star Wars items are on sale for at least 10% off the regular price, with a few things up to 30% off. For example, Clone Wars basic figures are just $5.49 each, while Vintage Collection basic figures are down to $6.99 each. Definitely worth a trip to your local store this week!